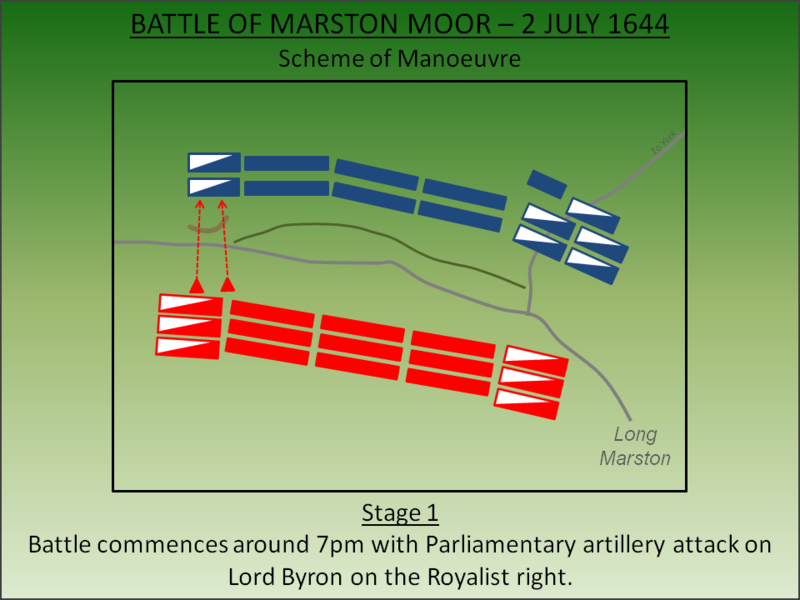 The largest battle ever fought on British soil, Marston Moor was a calamity for Royalist forces when they were overwhelmed by a combined Parliamentary and Scottish army. Defeat turned into a rout which saw the annihilation of the Royalist northern army culminating in the loss of York. In August 1643, after a sustained diplomatic mission on behalf of Parliament led by John Pym, Scotland entered the war against King Charles. The policies of the 1630s, where the King had attempted to reform the Scottish church away from Presbyterian lines and which had caused the Bishops Wars, had not been forgotten. Scottish forces crossed the River Tweed entering England on 18 January 1644 under the command of Alexander Leslie, Earl of Leven. William Cavendish, Marquis of Newcastle was tasked to intercept and destroy the Scottish army and accordingly he deployed his forces from the Midlands but crucially also withdrew a significant portion of Royalist cavalry from Yorkshire. Cavendish moved his forces to Newcastle-upon-Tyne but Leslie deliberately avoided confrontation with him and skirted his forces around the Royalist position. In March 1644 he took Sunderland. Concurrently the situation in Yorkshire was deteriorating for the Royalists. The withdrawal of forces to support Cavendish had emboldened the Parliamentarians who started raiding deep into formerly secure Royalist territory. Pickering was attacked whilst Bradford, Bridlington and Whitby were captured. This prompted John Belasyse, Royalist commander in Yorkshire, to mobilise his forces in an attempt to re-take Bradford. It failed and when the Parliamentary Army was reinforced by the arrival of Sir Thomas Fairfax, an attack was made on Belasyse's own headquarters at Selby. Bitter fighting in the town resulted in annihilation of half of the Royalist forces in Yorkshire. The situation for the Royalists was now critical as York, England's northern capital, was now under threat. Cavendish abandoned his attempts to bring Leslie to battle and started marching south to reinforce the city. The Scottish forces followed and rendezvoused with the forces of Ferdinando Fairfax, Lord Fairfax and his son, Sir Thomas. The Scottish-Parliamentary army was huge; numbering around 20,000 of which 4,000 were horse. They moved into position around York and placed the city, now garrisoned by Cavendish's army, under siege; if they could take it the loss would be a huge blow to the King's prestige. Initially a fairly lose blockade, it was tightened significantly when the already large army was bolstered by an additional 8,000 troops (split equally between infantry and cavalry) from the Eastern Association under Edward Montagu, Earl of Manchester. The significance of losing York was not lost on King Charles. He dispatched a force from the Midlands under the command of Prince Rupert numbering around 14,000 strong. By May he was in Cheshire and Lancashire reversing many of the gains won by Sir Thomas Fairfax earlier the same year. By late June he was approaching York and the Parliamentarians lifted their siege in order to combine their respective forces and moved to the south of the city towards Long Marston. Rupert entered York and relieved the city on 1 July 1644. At this point Prince Rupert could have allowed the Scottish-Parliamentary army to retreat unscathed. As would be seen later that year at the Second Battle of Newbury, relationships between the Generals could well have broken the force into its component parts without Royalist intervention. Rupert however decided to pursue and crossed the River Ouse. On the morning of 2 July 1644 his forces arrived on the moor near Long Marston to find the Scottish-Parliamentary force in the process of withdrawing to Tadcaster. Nevertheless the three Parliamentary commanders - Leven, Montagu and Fairfax - opted to attack. Their vanguard, almost at Tadcaster, was turned around and brought back to Long Marston. 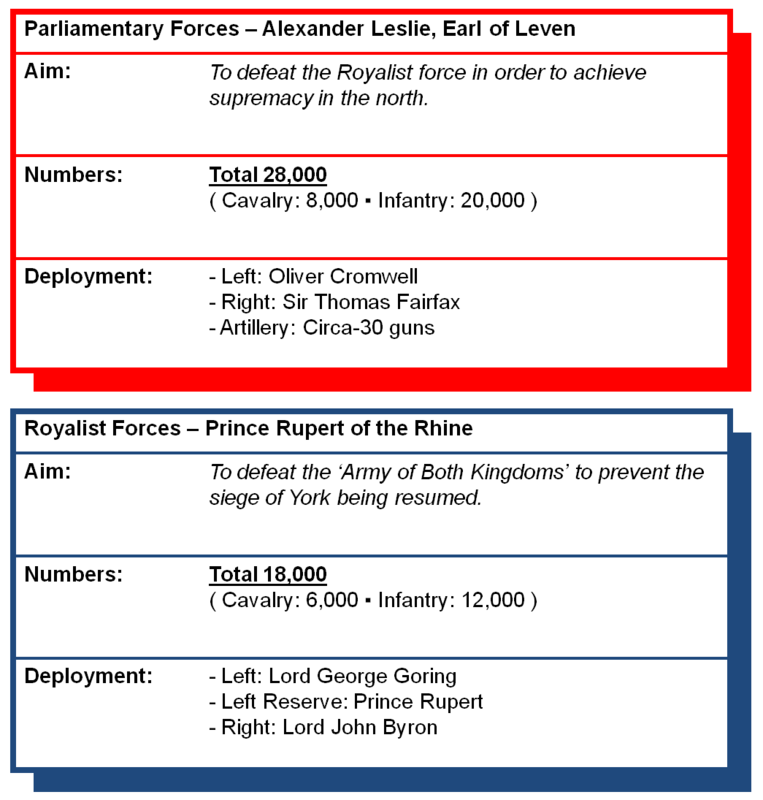 The combined Scottish-Parliamentary army now numbering around 28,000 due to the combined forces of the Eastern Association (Earl of Manchester), the Northern Association (Lord Fairfax) and the Scottish Covenanters (Leven). It was early evening before the battle started and many in the Royalist lines had presumed it was too late in the evening for an engagement; supply carts had already started distributing food for the soldiers many of whom had low morale after having been stood in light rain for much of the day. The Allies started the engagement around 7pm with an artillery bombardment focused on Lord Byron's horse on the Royalist right flank as well as a number of musketeers who had occupied a ditch in front of the horse. 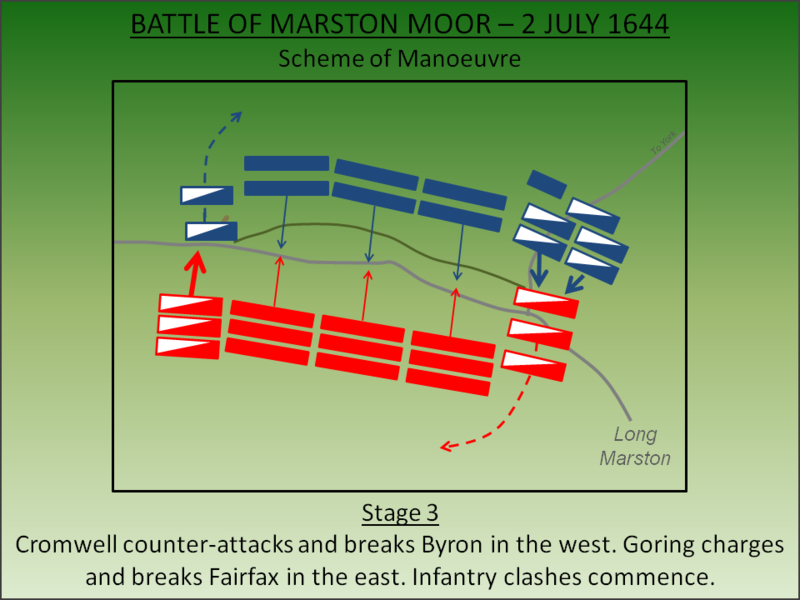 Byron had a distinct disadvantage in numbers against his opponents, led by Oliver Cromwell, on the Allies' Left. However a ditch and a series of rabbit warrens existed in front of his position making any direct assault on his lines difficult. He had been ordered to hold his ground and not advance but, sensing the low morale in his forces, Byron decided to attack. Concurrently Fairfax, leading the Allies' Right, started moving his cavalry along the York road but found the terrain difficult. A hedge that marked the boundary of cultivated land before the moor and a narrow lane both impeded his advance. As Byron moved his horse forward, they predictably became disorganised as they passed the ditch and rabbit warrens. Cromwell timed it perfectly charging the Royalist lines. 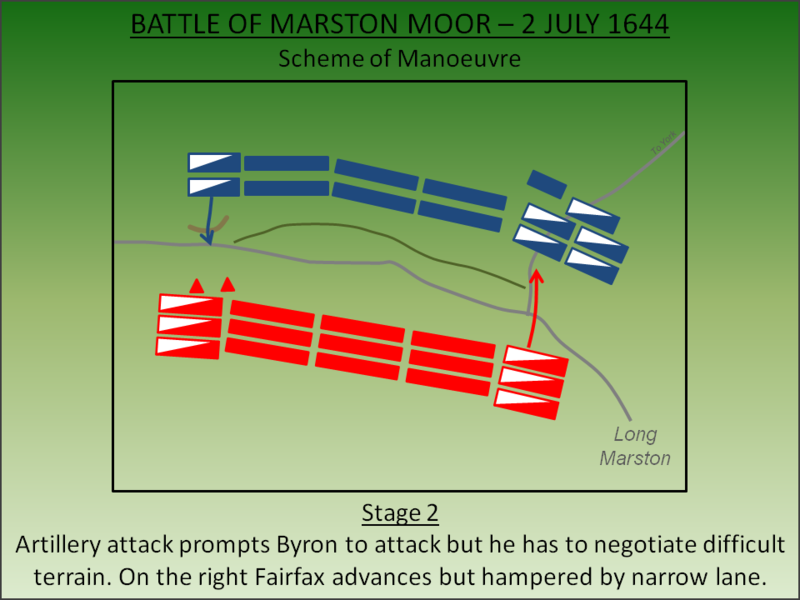 Both Byron's frontline and his reserve, led by Lord Richard Molyneux, were defeated and fled the field. On the other side of the battle the complete opposite happened. Goring, leading the Royalist Left, charged into Fairfax's horse whilst he was still trying to navigate around his own obstacles breaking both the Allies' frontline and the rear under Alexander Montgomerie, Earl of Eglington. With his cavalry wing in pieces, Sir Thomas Fairfax found himself behind Royalist lines. The rout of Byron had caused significant problems on the Royalist left with large numbers of Allied horse now attacking the flank of the infantry line. 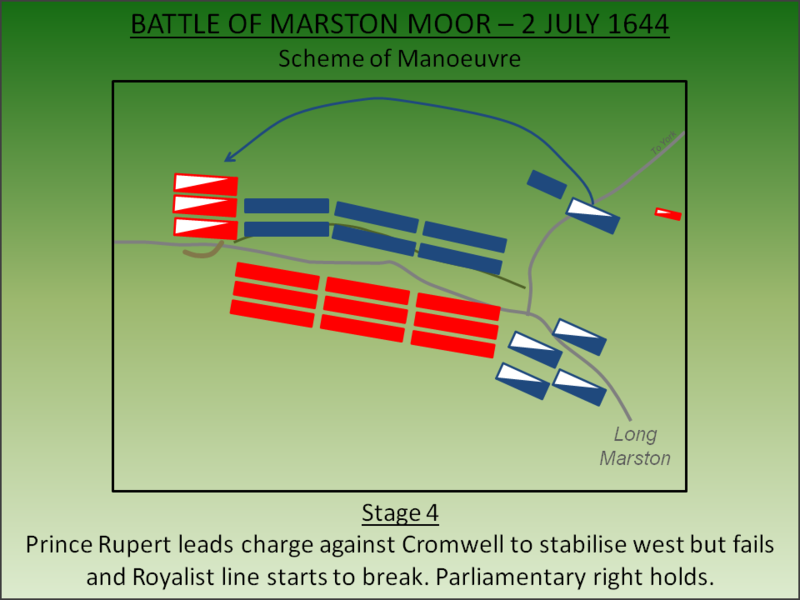 Prince Rupert led his cavalry reserve into the fray in an attempt to stabilise the situation but Cromwell had superiority in numbers and the Royalist line started to break. Sir Thomas Fairfax, having seen his own cavalry force defeated, rode around the back of the Royalist lines to join up with Cromwell. 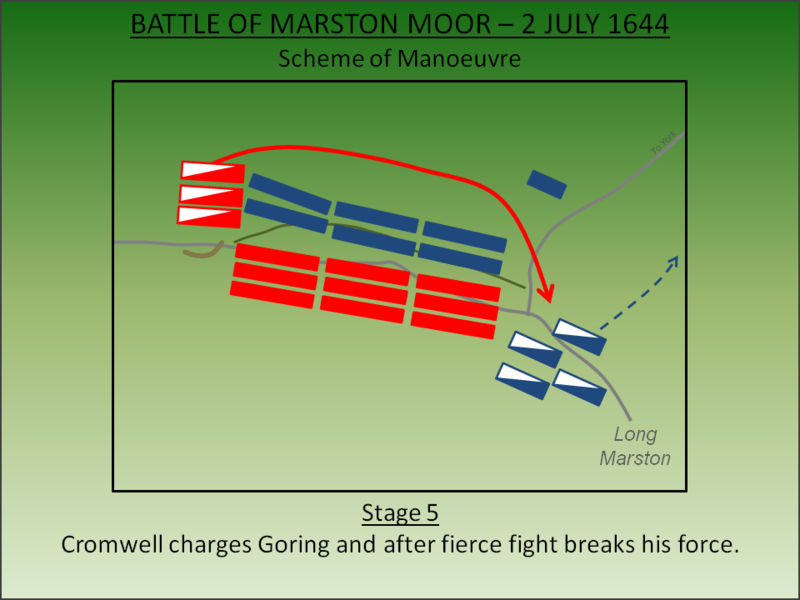 Seizing the initiative, he led Cromwell's horse around the back of Royalist lines to attack Goring's cavalry who were harrying the flank of the Allies' infantry line. A fierce fight ensued but eventually the Royalist cavalry broke and fled for York. The Royalist infantry, now heavily outnumbered and devoid of cavalry support, broke and fled back towards York. 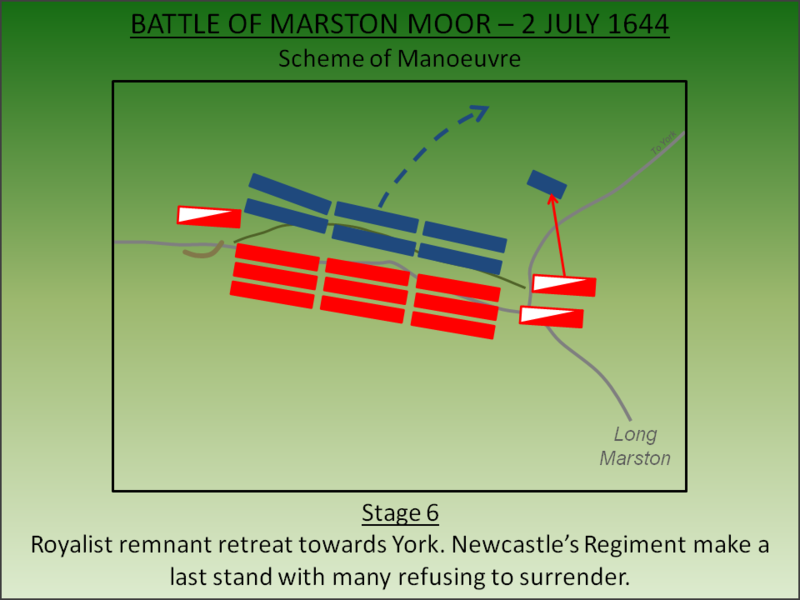 Only the Marquis of Newcastle's Regiment stood firm and stayed in the field, refusing quarter and fighting almost to the last man. The battle was a disaster for the Royalist cause; almost 4,000 were killed and a further 1,500 captured effectively destroying the northern Royalist army. With it the fate of the north was sealed - York surrendered on the 16 July 1644 leaving just isolated garrisons at Bolton, Helmsley, Knaresborough, Pontefract, Sandal, Scarborough and Skipton. The Royalists would take false hope from the victory at Lostwithiel the following month. But in reality the north of England had been lost and Parliament had freed spare capacity to fight harder in the south. The victory also secured Oliver Cromwell's reputation as an effective General that would secure him a role in the army despite the introduction of the Self Denying Ordnance later that year. Lancaster, J.H.D (2013). 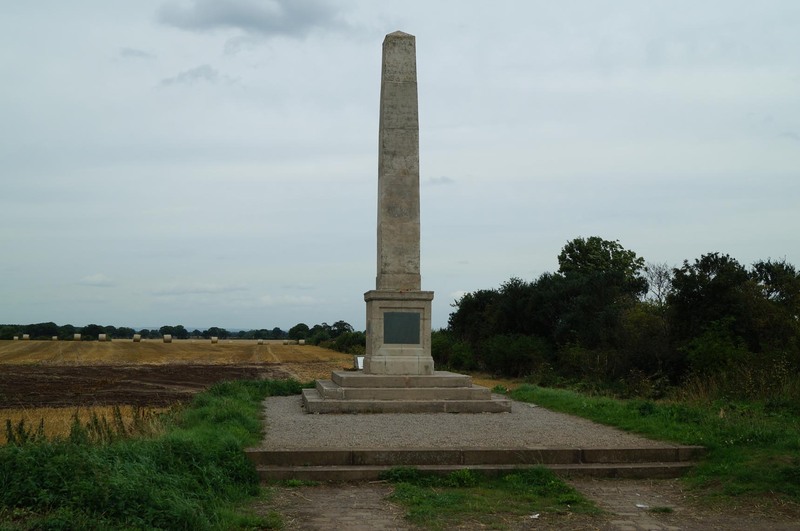 Marston Moor: Battlefield visit notes and observations. CastlesFortsBattles.co.uk. Ordnance Survey (2015). Harrowgate. 1:1250. Southampton. A monument marks the site of the battle along with an interpretation board. The monument provides a good view of the battlefield which remains undeveloped although more land is now under cultivation than in 1644. Furthermore the villages of Long Marston and Tockwith have only expanded slightly allowing the visitor to get a good appreciation for the terrain. The route of the current road, which runs directly through the centre of the battlefield, is the same as in the seventeenth century. Monument. 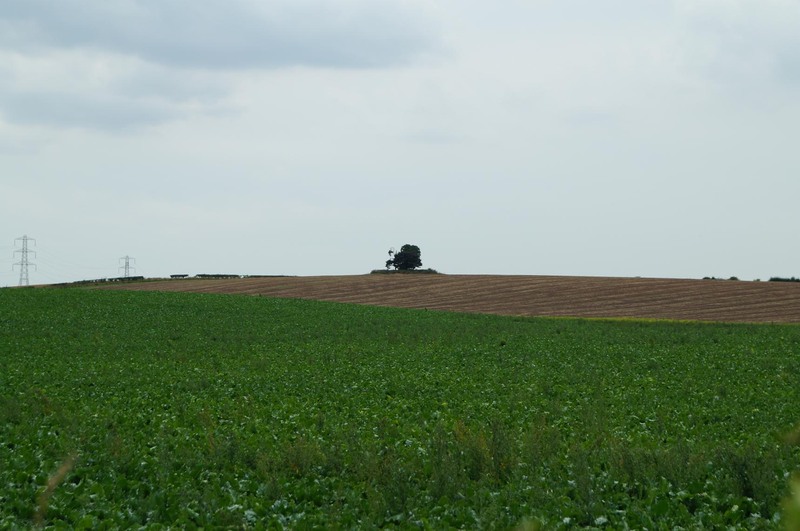 The monument is found immediately adjacent to the road and marks the approximate location of the cavalry engagements between Fairfax /Goring then Cromwell/Goring. Cromwell's Clump. This clump of trees was near the Earl of Leven's Command Centre. The memorial is on Tockwith Road between the villages of Long Marston and Tockwith. Using the lat/long is recommended as the battlefield is not sign-posted. Lay-by for several cars by monument.